On Friday, January 25th, I interviewed Lourdes Montes, a Community Bike Educator from Hacienda’s Andando en Bicicletas en Cully (ABC). I rode out to Cully for the interview with Omar Casillas, the Community Cycling Center’s Community Collaborations Manager. Omar and I met Lourdes at a taqueria across the street from Cully’s new, brightly-lit futsal court. Unable to find a place to lock our bikes, we asked the taqueria owner if we could lock them to the front grill of the bus that served as the kitchen for the restaurant. “Welcome to the struggles of biking in Cully,” Omar explained. The ABC bike committee formed two years ago as a result of a strong partnership between the Community Cycling Center and Hacienda during the Understanding Barriers to Bicycling project. It began with four women who wanted to make Cully a safer place for their children to ride bikes. Like almost all of the members of ABC, when Lourdes joined she did not own a bicycle. Neither did her children. 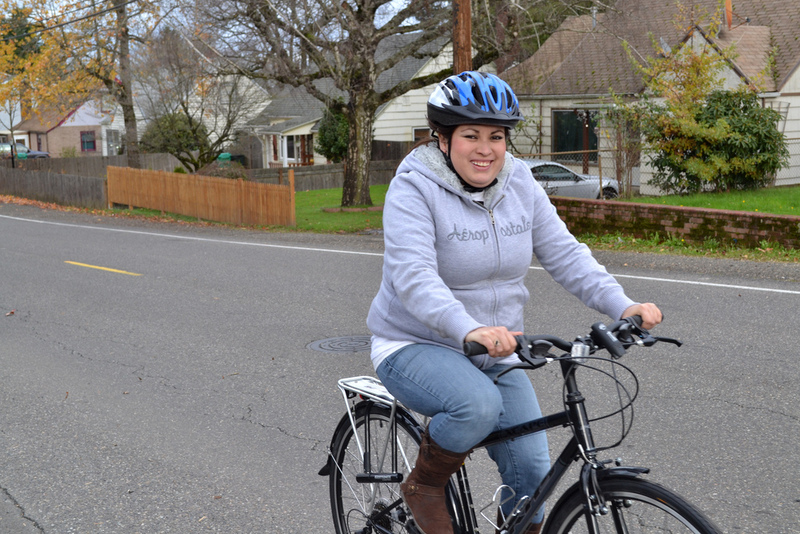 In November of last year, Lourdes earned a bicycle through the Create a Commuter program along with other members of ABC. This particular Create a Commuter workshop was unique in that it was the first time that portions of a workshop were taught by program participants. 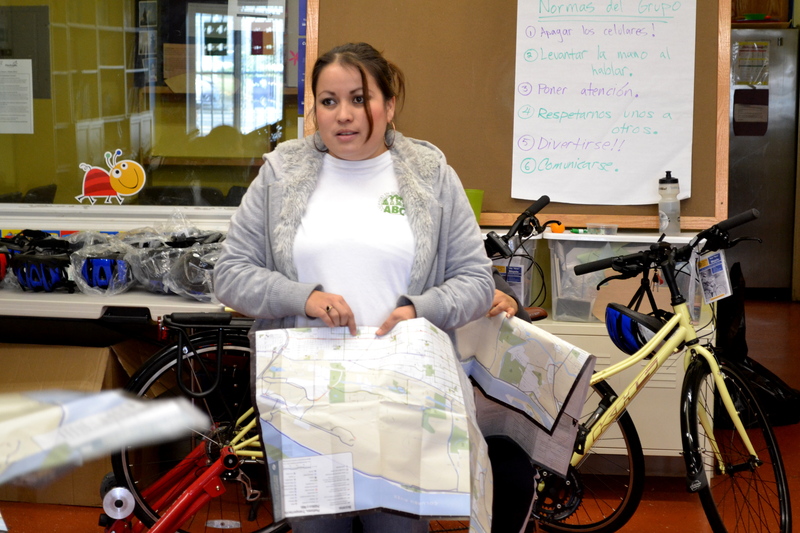 Lourdes demonstrated how to plan routes with bicycle maps and the importance of safely locking bikes, while other members of ABC showed the group how to fix a flat tire and adjust bicycle components. One month after the workshop, all three of Lourdes’ kids received their first bicycles at the Holiday Bike Drive. Since receiving their new bikes, Lourdes has taken her family on a couple of rides. Recently, her oldest son’s bike had a flat tire. Using the patch kit she received through Create a Commuter and the bike pump she bought at WalMart, she taught him how to fix it. “I really think he will be able to fix it on his own next time,” she explained. Lourdes added that she is excited to receive additional ride leader training this year from the Community Cycling Center in order to lead larger community group rides. Andando en Bicicletas en Cully has given Lourdes a way she can be both a teacher and a leader in the Cully community. “Before, I spent the day in my house,” she told me. “Our [Andando en Bicicletas en Cully] meetings are a place for me to exchange ideas, be heard, and make friends.” This new role for Lourdes exemplifies how the bicycle is a powerful tool, capable of engaging people in meaningful ways with their community.